Most of our professional griddles come with a True-Seasoned Finish, just like all of our cast iron. To keep this finish in tip-top condition, your griddle needs a little TLC every now and then. 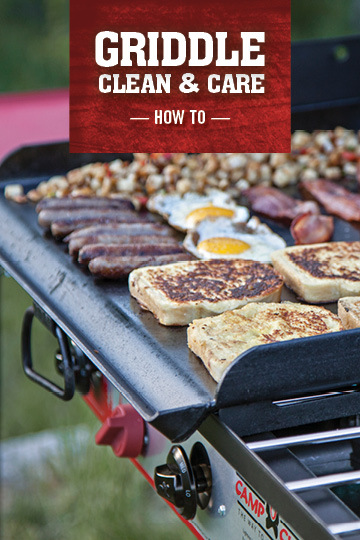 By following the guide below, you will help keep your griddle clean, prevent rust, and build up the glass-like finish to keep food from sticking. 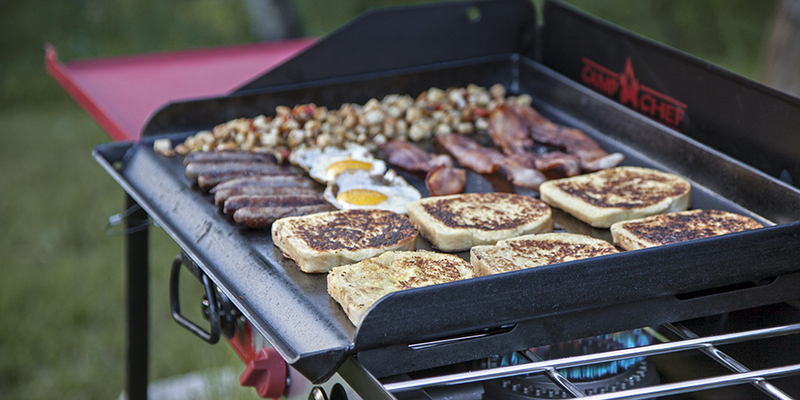 Giving your griddle time to pre-heat properly will ensure you’re getting the best cooking performance possible. Start by setting your heat to Medium or Med-Low for about 5 minutes. This should bring the griddle surface temperature to about 350°-400° F, depending on the weather and environment. Then turn the heat to Med-Low or Low for 2-3 minutes for uniform heat across the entire cooking surface. The steel heats up quickly but cools slowly, so you’ll have plenty of heat to work with even after you turn down the burners. You’re ready to get cooking. Managing the heat on your griddle is important to prevent any possible damage. While the steel is strong and durable, you should only use Low or Medium heat settings. This is especially important if you want to use different heat settings on a large griddle that covers multiple burners. You have the capability to warm a tortilla on one side and cook a fajita mix on the other, but you want to keep both settings on Medium or lower. After each use, clean off any food particles while the griddle is still warm. You might want to use a metal spatula or chain mail scrubber to remove stubborn bits. Then wash with hot water, mild dish soap (never use abrasive detergent), or our Cast Iron Cleaner. Rinse and dry thoroughly. Never scour or use a dishwasher, as this could chip the nice, seasoned finish you’re going for. Once your griddle is clean, slowly warm it up again on your stove. Apply a thin layer of Cast Iron Conditioner or cooking oil. We recommend Cast Iron Conditioner because it has a palm oil base, which boasts a longer shelf life than any other natural oil. Be sure that the entire surface, including all corners, have been coated thoroughly. This will ensure that all surfaces of your cookware will be properly seasoned. This finish helps protect the steel or cast iron from rust and contributes to a nonstick cooking surface. Let your griddle cool, then wipe off excess conditioner or oil with a clean cloth. After your griddle is clean, dry, and seasoned, you will need to store it in a dry, clean area. You can use one of our carry bags, specifically designed to hold your professional griddle. If you store it in one of these bags long-term, leave the zipper open 2-4 inches so the metal doesn’t “sweat.” This will prevent rusting. • Be sure that your griddle is level before cooking, so that any juices or grease will drain properly. To test your griddle’s angle, pour a cup of water on the corner farthest from the grease drain and see where it flows. • Use our grease cup accessory for an easy clean-up. • If you need to adjust the heat on your griddle, do so a little at a time. The metal will heat quickly and cool slowly. • Lightly oil the griddle before each use while it’s heating up. You can use Camp Chef Conditioner or cooking oil. • The steel will continue to antique and darken with each use—it’s okay for it to accumulate a patina. • Rusty, metallic tastes or discolored foods are signs of inadequate seasoning or may result from cooking heavily acidic foods. If this occurs, wash the griddle thoroughly and re-season. • Check out all the cooking accessories we offer to go along with your griddle. You’ll be cooking like a pro in no time.